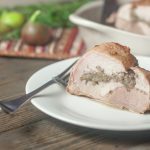 Rosemary Fig Stuffed Pork is savory with a hint of sweet figs, and is quick and easy for a family dinner or holiday table. Well, we decided not to talk about the terrifying disaster that is American politics on the site. Nope, we're not going to talk about how electing a homophobic racist who acts like a spoiled child is going to effect the world. Nor will I tell you about my theories about what Trump's end-game in running for president actually are. But I thought you'd get a kick out of the dating site that Holley found: Maple Match. This is a new dating site that is essentially marketing to Americans who are planning on fleeing their country if Trump gets elected. Maple Match is looking to connect these Americans with Canadians to date. I kept forgetting the name of Maple Match, so I made up some of my own. “Bag a Canadian”, “Bang a Canadian”, and “Bang a Beaver”. And just in case you're interested in starting a site with any of these URL's, they were surprisingly all available when I checked. Can you believe nobody owns these domains? Back to not talking about the presidential candidates: Every time I hear Trump say that he wants to make the country great again, I think of the opening scene to tv series The Newsroom (which I absolutely loved – I'm kind of in love with Olivia Munn) “America is not the greatest country in the world anymore”. I feel like that guy Barack was really trying to move the States forward. Speaking of Obama, I like that he has a sense of humor. Holley found this fantastic link for me. It's a bunch of Canadians using the hashtag #TellAmericaItsGreat. Very cute. I like the photos of Obama and Trudeau (that's our country's leader FYI). You guys are great. That's why we like to give you a hard time. The way one gives a big sibling the gears. Cool beans. 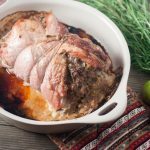 Rosemary Fig Stuffed Pork. Enjoy it while watching the election. Enjoy it while you're planning/packing to move North of the border. Enjoy it on Thanksgiving. Enjoy it tonight! 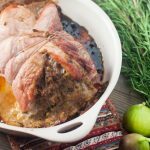 Rosemary Fig Stuffed Pork is savory with a hint of sweet figs, quick and easy for a family dinner or holiday table. In a pan over medium heat, melt butter. Add chopped celery and onions, saute until tender and fragrant. Add port roasted figs, thyme, and rosemary. Add coconut flour, and stir well, removing from heat. While the stuffing is cooling, fillet the pork tenderloin so that it lays flat. Sprinkle the pork with salt. Once stuffing has cooled to “slightly warm” mix in one egg (too hot and the egg will cook). Spread stuffing in the middle of the pork in a thin layer, gently rolling the pork up and tying with the butcher string. Pop in the oven for 4o-45 minutes, or until the internal temperature of the pork reaches 150F. Don't want to roast figs? Easy, just dice up 6-8 dried figs, soak in hot water and drain before adding to the stuffing! 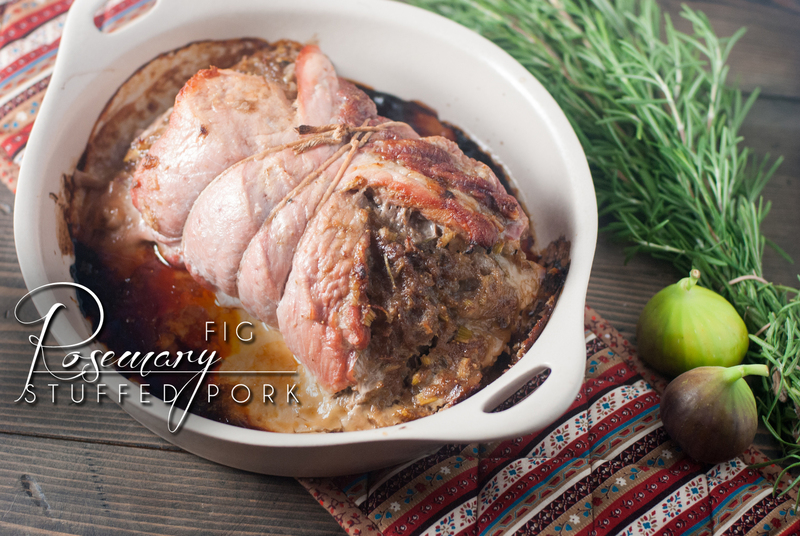 Port roasted figs pair perfectly with rosemary and pork! Half figs place in an oven safe dish. Drizzle honey, and sprinkle with salt and cinnamon. 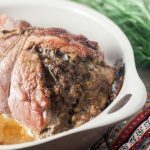 Pour port over everything and roast for 35 minutes.